Remove the condition and it works again i.e. values are retrieved. I set up another test from scratch with the same result. the plugin is searching from the input, if you hide it the input, the search plugin has nothing to reference and no data source, this is normal behaviour. Furthermore - if the input element WAS hidden then you wouldn’t be able to enter the search criteria! Seems as though your conditions are being met, its hard to tell without more information. You definitely wasnt clear, it was a struggle to read, try use some paragraphing & commas. Huh? 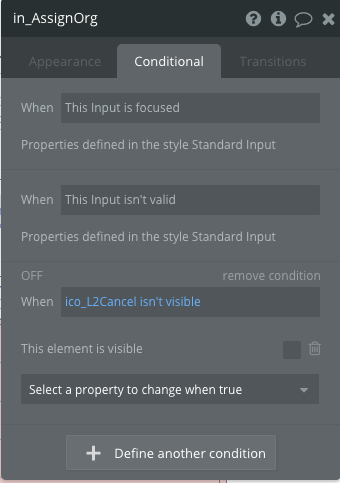 If the condition WAS being met then the input field would not be visible. The input condition is not being met - so the input IS visible allowing me to enter the search criteria and observe the plug failing. Otherwise how could I test it? I can’t reproduce the issue in a Test app - but here is the Test app describing what can’t be reproduced! In my production app I can add an icon element to the page that is visible on page load, add a condition to the input element so that the input element is not visible when the icon is not visible. This should result in no change (since the icon element IS visible) - but it disables the plugin’s search.